We are a restaurant that sells traditional foods of Japanese "Udon". Udon is a type of thick wheat flour noodle of Japanese cuisine. Ownerchef has created a real delicious soup and noodle by the research from many experience and training of Sanuki authentic noodles. We want to provide delicious UDON, warm heart, usually Japan to customer. We are dedicated every day for making our menu with confidence in safety. Foreign tourists coming to Miyoshiya is increasing every day. So I want to spread throughout the world the name of "udon" instead of "Japanese Noodle". I would like to provide the taste of real Japanese food to foreign tourist. The town of Osaka in which we live is a town of a smiling face and food. I would like to propose a plan that you can take home as good memories. Also, I assume a food education activity, such as child care centers in the region udon. I hope children can feel the taste and fun to make UDON their own. We had a great time learning to make udon noodles and tasting sake with this amazing character! A little far outside of Osaka tourist areas but not hard to reach via the train. Hiro was very welcoming and enthusiastic opening his restaurant to us and practicing broken English while we practiced/butchered Japanese. We definitely left a little buzzed but with full bellies of our own made noodles! 100% recommend! Small class with care and equipment for everyone. My kids (8 & 6) and we enjoyed making own udon and eating it with great conversations. Marvellous session with the one and only Udon Meister of Osaka, Hiro! I had so much tasty udon that afternoon that I was still full the next morning. I had some very special sake tasting too. Now I will try to make my own udon noodles at home. I heartily recommend this to everyone. this man is the best in all definition! is the human with good contact and communication! We had such a great time making udon noodles from start to finish. 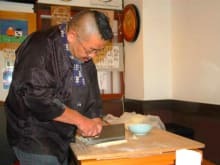 Chef Hironobu and his daughter were so kind and very funny. Great hospitality and wonderful hosts! They answered all of our questions and explained everything very clearly. It was definitely a wonderful experience that we would recommend to anyone who wants to make udon at home!